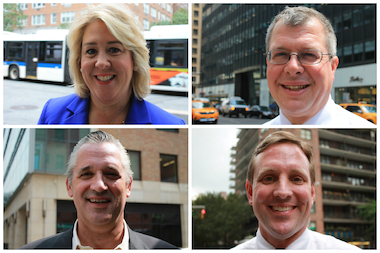 The four Democratic candidates running for the 76th Assembly District seat, clockwise from the top left: Rebecca Seawright, David Menegon, Ed Hartzog and Gus Christensen. 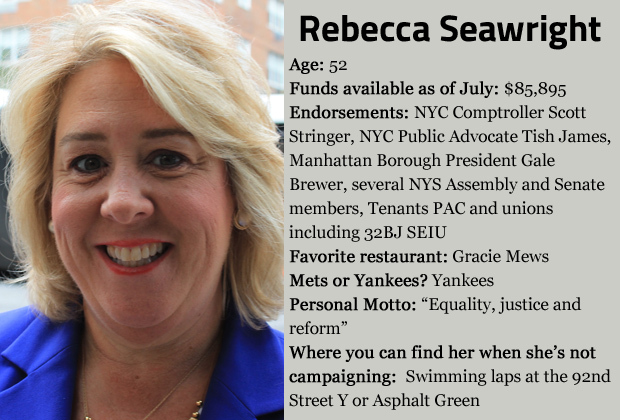 UPPER EAST SIDE — The four Democrats running for state Assembly on the Upper East Side include a retired Army colonel, a "recovering" Wall Street banker, an advocate for green spaces and a PTA mom. David Menegon, Gus Christensen, Ed Hartzog and Rebecca Seawright are vying for scandal-plagued Micah Kellner's 76th Assembly District seat after Kellner announced he would not seek reelection. The Democratic primary will take place Sept. 9. The winner will face Republican David Garland in the general election. The district covers from Third Avenue to the East River and from 61st Street to 92nd Street, as well as Roosevelt Island. The Democratic candidates for the seat will debate each other at Lenox Hill Neighborhood House, 331 E. 70th St., at 6:30 p.m. Monday. 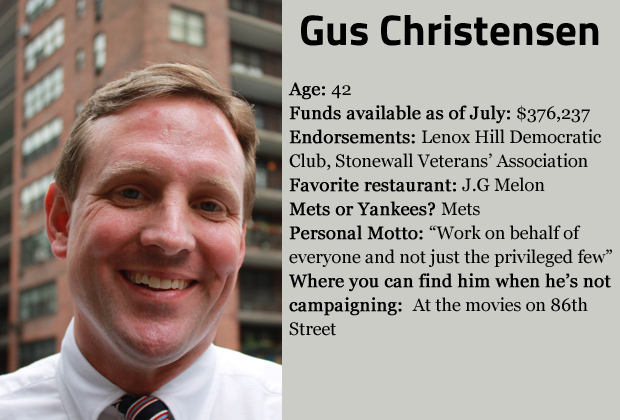 Gus Christensen worked as an investment and real estate banker for almost 20 years before quitting his job in February to run for Assembly. Born on the Upper East Side, the Yale and University of Pennsylvania graduate lived in Brooklyn and Midtown before settling back in the 76th Assembly District in 2009 with his wife Courtney, who is expecting their first child. Q: What is the district's biggest issue? A: The 91st Street Marine Transfer Station. It’s going to create new problems such as increased congestion, air pollution and health issues, without solving any of the old problems, [like] borough equity when it comes to garbage trucks and sanitation facilities. It’s also going to cost a tremendous amount of money. It’s now or never to stop it. There’s nothing that has been built yet that cannot be repurposed for another use, such as an extension of Asphalt Green and Carl Schurz Park. Yorkville and East Harlem need more green space. Q: What is the first thing you’re going to do if you’re elected? A: It is very realistic that we will increase New York State minimum wage to $10 to $11 an hour in the first session after I’m elected. As a city, New York should also have the flexibility to increase its minimum wage to approximately $13 an hour. Q: How are you different from the other candidates? A: I think I’m the best fit for our district because I have real ideas and real plans for local issues, but I’m also thinking more broadly about all New Yorkers and about our country. I believe that Albany needs leaders who understand budgets and finance and who have a deep commitment to our progressive values. Q: What’s one thing people don’t know about you? I stay up late watching science fiction TV shows too often. I’m a huge "Dr. Who" fan. 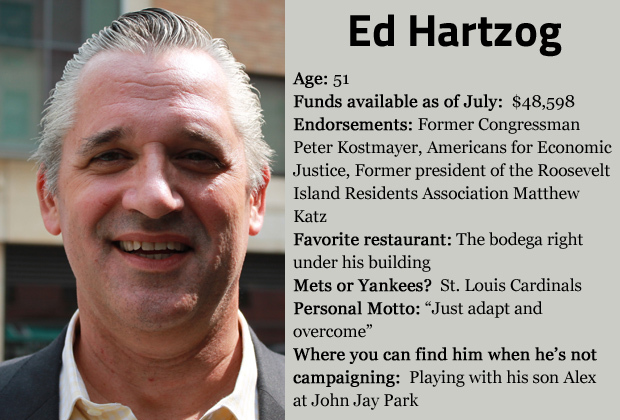 Ed Hartzog, an attorney and a Community Board 8 member, previously ran unsuccessfully for City Council in 2013, a race during which he told a DNAinfo reporter “What's a pretty girl like you doing reading those?” when she asked him about his campaign finance documents. Born in St. Louis, Missouri, Hartzog has been living on the Upper East Side with his wife Nalika for the past 13 years. They have a son named Alex. Q: What is the district’s biggest issue? A: Over-development in the Upper East Side. It runs through all the issues: the Second Avenue subway, the Marine Transfer Station and what’s happening on York Avenue, especially along Roosevelt Island. We need to have a serious reset on the way we’re going because, as you develop, you bring more people in. We need to make sure we have the infrastructures that supports that, while preserving our community. A: I’d like to create the open green space that I think people in this district crave. There is one project that needs to be done: the East River Esplanade, from 59th to 120th Street. We are the only district without the kind of river access and greenery that’s part of living in the rest of the city. And finishing the esplanade would be a job creator. A: I have the experience of growing up in Washington, D.C. [where his father was director of the National Park Service] and watching the government first hand as a kid, at a time when it was working. I think my graduate degree in environmental and economic policy gives me a unique educational difference [from] the other candidates. A: I used to be a pretty good competitive squash player, going up and down the Eastern Seaboard to play tournaments. 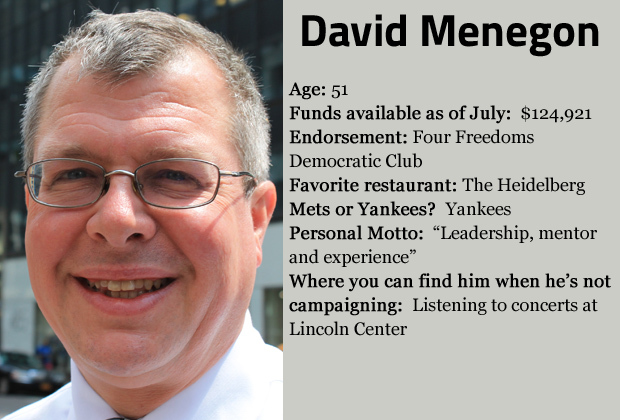 David Menegon, a 25-year Xerox executive, is also an Army veteran, holding the rank of colonel. He served two tours in Iraq, where he was responsible for economic and development programs. Menegon has been living in the 76th District for the past 16 years. A: The lack of affordable housing for middle and lower-income people. It affects pretty much everybody: families, students and seniors. The solution is to work with developers to have a 50/30/20 split: 50 percent of the units for market-rate tenants, 30 percent for middle-income tenants and 20 percent for low-income tenants. A: The first thing I would do is constituent services for the people in the community and particularly for the seniors. There are a lot of seniors that need to be directed to agencies to protect them from being kicked out of their apartment by unscrupulous landlords. A: I’m the one candidate who has the experience to get things done. I can get people to work together even though they were not predisposed to do so. When I was serving in Iraq, I got people who were usually killing each other to sit at the same table and find an agreement. People in this district need someone they can trust. I was a bassoonist for many years. I’m a lover of the arts and I really enjoy the opera. Attorney Rebecca Seawright was born in Texas and in 1995 moved to the Upper East Side, where she’s raising her two kids, Haley and Brad, with her husband Jay Hershenson. A first-time candidate, Seawright serves as the chairwoman of the Feminist Press and of the Law School Board of Visitors at CUNY. A: It’s public education. We need more middle school seats in the UES, additional resources to support our teachers, and we need to fight for smaller-size classes in public schools. As a PTA mom, with children in the public school system, I’ve seen overcrowded classrooms and I’ve helped raise money for our public schools. A: I would request to be on the [Assembly's] Education Committee in order to be a strong voice fighting for additional resources and schools on the UES. I would also request to be on the Corporations and Authorities committee because it oversees Roosevelt Island as well as the MTA. A: I’m the only candidate that has raised her children in the public school system. I’m the only candidate that is an active PTA parent and that has experienced the challenges with our public school system and seen the need for additional funding. A: I’m a good negotiator. Chairing several boards has given me the negotiating skills to bring all sides together for a common goal.